Audrey J. Weiss, Ph.D., Kevin C. Heslin, Ph.D., Marguerite L. Barrett, M.S., Rwaida Izar, M.P.H., and Arlene S. Bierman, M.D., M.S. Eighty percent of U.S. adults aged 65 years and older have multiple chronic conditions (e.g., heart disease, diabetes, arthritis, and depression) compared with less than 20 percent of adults aged 18-44 years.4 Chronic pain is common among older adults,5 and more than one-third of older Americans are living with a disability,6 making this population more likely than younger adults to receive an opioid prescription.7 In addition, complex social needs and mental health issues including depression, substance abuse, cognitive decline, and dementia often go unrecognized and/or complicate clinical management.8, 9 Compounded by the physiologic changes associated with aging, these conditions place older adults using opioid medications at increased risk for adverse events including injurious falls10 and delirium,11 which may result in ED visits or hospital admissions. This Healthcare Cost and Utilization Project (HCUP) Statistical Brief presents statistics on opioid-related hospital stays and ED visits among patients aged 65 years and older in fiscal year (FY) 2010 (from quarter 4 of 2009 through quarter 3 of 2010) and FY 2015 (from quarter 4 of 2014 through quarter 3 of 2015), hereinafter referred to as 2010 and 2015.15 The number and rate of opioid-related stays and ED visits in 2010 and 2015 are provided for three distinct age groups: 65-74 years, 75-84 years, and 85 years and older. The percentage of opioid-related inpatient stays and ED visits that involved a principal opioid diagnosis is provided for each of the three age groups in 2015. 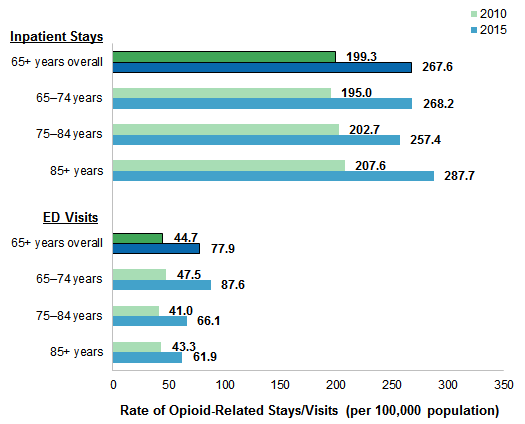 Characteristics of opioid-related stays and ED visits versus nonopioid-related stays and visits among adults aged 65 years and older are presented for 2015. Identification of opioid-related stays and ED visits is based on all-listed diagnoses and includes events associated with prescription opioids or illicit opioids such as heroin. Differences greater than 10 percent between estimates are noted in the text. 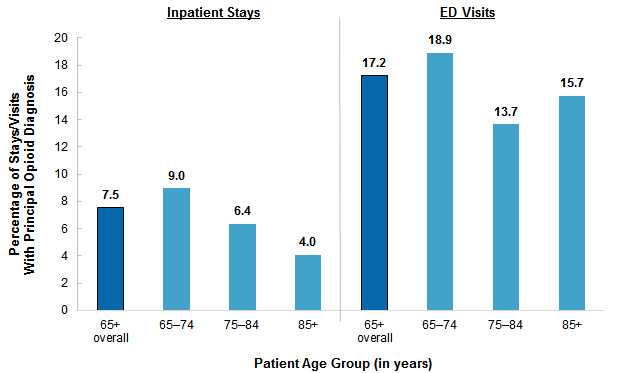 Figure 1 provides the number of opioid-related inpatient stays and ED visits among patients aged 65 years and older by patient age group in 2010 and 2015. Note: Number of stays and visits were based on all-listed diagnoses and rounded to the nearest hundred. 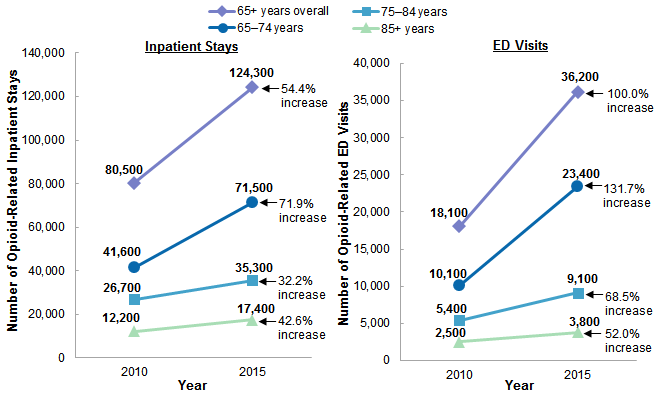 Two line graphs, one for inpatient stays and one for ED visits, that show the number of opioid-related inpatient stays or ED visits among patients aged 65+ years by age group in 2010 and 2015. Inpatient stays: 65+ years: 2010, 80,500; 2015, 124,300, for a 54.4% cumulative increase. 65-74 years: 2010, 41,600; 2015, 71,500, for a 71.9% increase. 75-84 years: 2010, 26,700; 2015, 35,300, for a 32.2% increase. 85+ years: 2010, 12,200; 2015, 17,400, for a 42.6% cumulative increase. ED visits: 65+ years: 2010, 18,100; 2015, 36,200, for a 100.0% cumulative increase. 65-74 years: 2010, 10,100; 2015, 23,400, for a 131.7% increase. 75-84 years: 2010, 5,400; 2015, 9,100, for a 68.5% increase. 85+ years: 2010, 2,500; 2015, 3,800, for a 52.0% cumulative increase. The number of opioid-related inpatient stays and ED visits increased substantially between 2010 and 2015 among patients aged 65 years and older. Overall, between 2010 and 2015, the number of opioid-related inpatient stays increased 54.4 percent among patients aged 65 years and older, from 80,500 stays in 2010 to 124,300 stays in 2015. This increase occurred among all three age groups (65-74 years, 75-84 years, and 85 years and older), but the increase was largest among patients aged 65-74 years (71.9 percent increase) compared with the two older age groups (32.2 percent increase among patients aged 75-84 years and 42.6 percent increase among patients aged 85 years and older). Similarly, between 2010 and 2015, the number of opioid-related ED visits doubled among patients aged 65 years and older, from 18,100 visits in 2010 to 36,200 visits in 2015. Again, an increase was observed among all three age groups but was largest among patients aged 65-74 years (131.7 percent increase) compared with those aged 75-84 years (68.5 percent increase) and those aged 85 years and older (52.0 percent increase). Figure 2 presents the rate of opioid-related inpatient stays and ED visits per 100,000 population among patients aged 65 years and older by patient age group in 2010 and 2015. The percentage change in these rates is provided in Figure 3. Two bar charts, one for inpatient stays and one for ED visits, that show the rate of opioid-related inpatient stays and ED visits per 100,000 population among patients aged 65+ years by age group in 2010 and 2015. Inpatient stays: 65+ years: 2010, 199.3; 2015, 267.6. 65-74 years: 2010, 195.0; 2015, 268.2. 75-84 years: 2010, 202.7; 2015, 257.4. 85+ years: 2010, 207.6; 2015, 287.7. ED visits: 65+ years: 2010, 44.7; 2015, 77.9. 65-74 years: 2010, 47.5; 2015, 87.6. 75-84 years: 2010, 41.0; 2015, 66.1. 85+ years: 2010, 43.3; 2015, 61.9. The rate of opioid-related inpatient stays and ED visits increased substantially between 2010 and 2015 among patients aged 65 years and older. Overall, between 2010 and 2015, the rate of opioid-related inpatient stays increased 34.3 percent among patients aged 65 years and older, from 199.3 stays per 100,000 population in 2010 to 267.6 stays per 100,000 population in 2015. An increase occurred among all three age groups: 65-74 years (37.6 percent increase), 75-84 years (27.0 percent increase), and 85 years and older (38.6 percent increase). Figure 3 provides the percentage change from 2010 to 2015 in the population rate of opioid-related inpatient stays and ED visits among patients aged 65 years and older by patient age group. For comparison, the percentage change in the rate of nonopioid-related inpatient stays and ED visits among patients aged 65 years and older is presented. Two bar charts, one for inpatient stays and one for ED visits, that show the percentage change in rate of opioid-related stays and visits among patients aged 65+ years by age group in 2010 and 2015. Inpatient stays: 65+ years overall, 34.3; 65-74 years, 37.6; 75-84 years, 27.0; 85+ years, 38.6, compared with minus 17.4 for non-opioid-related stays. ED visits: 65+ years overall, 74.2; 65-74 years, 84.5; 75-84 years, 61.5; 85+ years, 43.2, compared with 17.4 for non-opioid-related stays. Among patients aged 65 years and older, the rate of opioid-related inpatient stays increased between 2010 and 2015, whereas the rate of nonopioid-related stays decreased; the rate of opioid-related ED visits increased substantially more than did nonopioid-related visits. Among inpatient stays for patients aged 65 years and older, the rate of opioid-related stays increased between 27.0 and 38.6 percent from 2010 to 2015, depending on the age group. In contrast, during this same time period the rate of nonopioid-related stays decreased 17.4 percent among patients aged 65 years and older. Among ED visits for patients aged 65 years and older, the rate of opioid-related ED visits increased between 43.2 and 84.5 percent from 2010 to 2015, depending on the age group. Although the rate of nonopioid-related ED visits also increased during this time period among patients aged 65 years and older, the 17.4 percent increase was substantially lower than the increase in the rate of opioid-related ED visits. 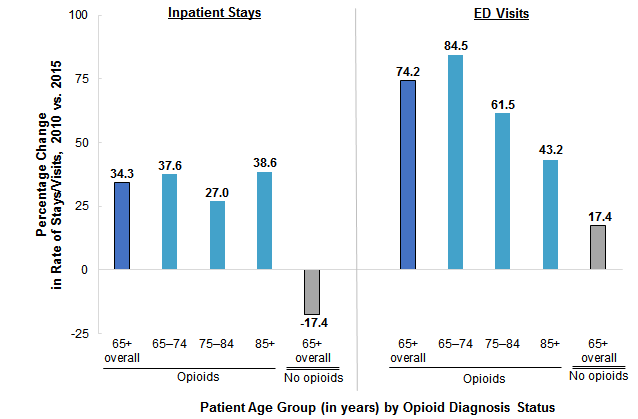 Figure 4 presents the percentage of opioid-related inpatient stays and ED visits that involved a principal opioid diagnosis among patients aged 65 years and older, by patient age group, in 2015. Two bar charts, one for inpatient stays and one for ED visits, that show the percentage of opioid-related stays and visits with a principal opioid diagnosis by age group in 2015. Inpatient stays: 65+ overall, 7.5; 65-74 years, 9.0; 75-84 years, 6.4; 85+ years, 4.0. ED visits: 65+ overall, 17.2; 65-74 years, 18.9; 75-84 years, 13.7; 85+ years, 15.7. Among patients aged 65 years and older, opioid-related ED visits more commonly had opioids as a principal diagnosis (vs. a secondary diagnosis) than did opioid-related inpatient stays. Opioids was listed as a principal diagnosis more than twice as often among opioid-related ED visits (17.2 percent) than among opioid-related inpatient stays (7.5 percent) for patients aged 65 years and older. This pattern held for each of the three specific older age groups, with the differential the highest among patients aged 85 years and older (15.7 percent of ED visits vs. 4.0 percent of inpatient stays with a principal opioid diagnosis). The percentage of opioid-related inpatient stays and ED visits with opioids as the principal diagnosis in 2015 was highest among patients aged 65-74 years compared with patients in the two older age groups. Among patients aged 65 years and older with an opioid-related inpatient stay in 2015, a larger percentage of stays involved a principal diagnosis of opioids among patients aged 65-74 years (9.0 percent) than among patients aged 75-84 years (6.4 percent) and 85 years and older (4.0 percent). Similarly, for opioid-related ED visits in 2015, a larger percentage of visits involved a principal opioid diagnosis among those aged 65-74 years (18.9 percent) than among those aged 75-84 years (13.7 percent) and those aged 85 years and older (15.7 percent). Table 1 provides hospital resource use characteristics for opioid-related inpatient stays and ED visits among patients aged 65 years and older in 2015. For comparison, hospital resource use characteristics are also provided for nonopioid-related inpatient stays and ED visits. Note: Number of stays/visits and average costs/charges were rounded to the nearest hundred. The average cost or charge for opioid-related inpatient stays and ED visits among patients aged 65 years and older was higher in 2015 than was the cost or charge for nonopioid-related stays and visits in this age group. Among patients aged 65 years and older, the average cost of opioid-related inpatient stays in 2015 was 12.9 percent higher than the average cost of nonopioid-related stays ($14,900 vs. $13,200). Similarly, the average charge for opioid-related ED visits in 2015 was 34.7 percent higher than the average charge for nonopioid-related ED visits ($6,600 vs. $4,900). The average opioid-related inpatient stay also was 14.4 percent longer than the average nonopioid-related stay among older adults (6.0 vs. 5.2 days). A higher proportion of patients aged 65 years and older were discharged to a nonhospital institution, such as a skilled nursing facility or intermediate care facility when the hospitalization or ED visit was opioid related versus nonopioid related. In 2015, a higher proportion of patients were discharged to a nonhospital institution, such as a skilled nursing facility or intermediate care facility, when the hospitalization was opioid related rather than nonopioid related (36.9 vs. 29.6 percent of inpatient stays and 6.2 vs. 3.7 percent of ED visits). A higher proportion of patients aged 65 years and older left the hospital against medical advice and a lower proportion died in the hospital when the hospitalization was opioid related versus nonopioid related. In 2015, the proportion of patients aged 65 years and older who left the hospital against medical advice was higher among opioid-related than among nonopioid-related inpatient stays (1.4 vs. 0.5 percent of stays) and ED visits (1.6 vs. 1.1 percent of visits). The proportion of patients aged 65 years and older who died during their hospitalization was lower among opioid-related than among nonopioid-related inpatient stays (2.7 vs. 3.7 percent of stays) and ED visits (0.3 vs. 0.6 percent of visits). 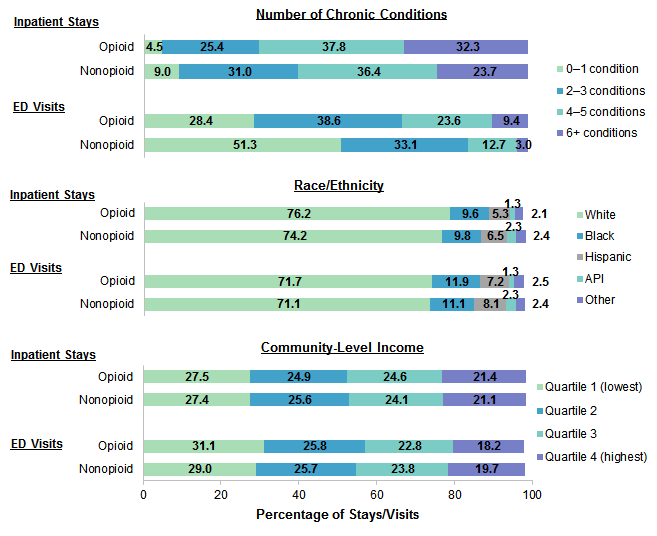 Figure 5 presents the distribution of opioid-related versus nonopioid-related inpatient stays and ED visits among patients aged 65 years and older by number of chronic conditions, race/ethnicity, and community-level income in 2015. Note: Secondary diagnoses used to identify chronic conditions may not be reported on ED visit records as frequently as on inpatient discharge records. Three bar chartsâ€”one for number of chronic conditions, one for race/ethnicity, and one for community-level incomeâ€”that show these percentage distributions among opioid-related and non-opioid-related stays and visits for patients aged 65+ years in 2015. Number of chronic conditions: opioid inpatient stays: 0-1 condition, 4.5; 2-3 conditions, 25.4; 4-5 conditions, 37.8; 6+ conditions, 32.3. Nonopioid inpatient stays: 0-1 condition, 9.0; 2-3 conditions, 31.0; 4-5 conditions, 36.4; 6+ conditions, 23.7. Opioid ED visits: 0-1 condition, 28.4; 2-3 conditions, 38.6; 4-5 conditions, 23.6; 6+ conditions, 9.4. Nonopioid ED visits: 0-1 condition, 51.3; 2-3 conditions, 33.1; 4-5 conditions, 12.7; 6+ conditions, 3.0. Race/ethnicity: opioid inpatient stays: White, 76.2; Black, 9.6; Hispanic, 5.3; API, 1.3; Other, 2.1. Nonopioid inpatient stays: White, 74.2; Black, 9.8; Hispanic, 6.5; API, 2.3; Other, 2.4. Opioid ED visits: White, 71.7; Black, 11.9; Hispanic, 7.2; API, 1.3; Other, 2.5. Nonopioid ED visits: White, 71.1; Black, 11.1; Hispanic, 8.1; API, 2.3; Other, 2.4. Community-level income: opioid inpatient stays: Quartile 1 (lowest), 27.5; Quartile 2, 24.9; Quartile 3, 24.6; Quartile 4 (highest), 21.4. Nonopioid inpatient stays: Quartile 1 (lowest), 27.4; Quartile 2, 25.6; Quartile 3, 24.1; Quartile 4 (highest), 21.1. Opioid ED visits: Quartile 1 (lowest), 31.1; Quartile 2, 25.8; Quartile 3, 22.8; Quartile 4 (highest), 18.2. Nonopioid ED visits: Quartile 1 (lowest), 29.0; Quartile 2, 25.7; Quartile 3, 23.8; Quartile 4 (highest), 19.7. The proportion of patients aged 65 years and older with multiple chronic conditions in 2015 was higher for opioid-related than for nonopioid-related hospitalizations. Among patients aged 65 years and older, 95.5 percent of opioid-related inpatient stays in 2015 involved multiple chronic conditions, compared with 91 percent of nonopioid-related stays. A total of 32.3 percent of opioid-related stays involved at least six chronic conditions versus only 23.7 percent of nonopioid-related stays. Similarly, the proportion of ED visits that involved multiple chronic conditions was higher among opioid-related than nonopioid-related visits. White patients constituted the majority of opioid-related hospitalizations among those aged 65 years and older. Among patients aged 65 years and older, more than three-fourths (76.2 percent) of opioid-related inpatient stays in 2015 involved White patients. This was consistent with the proportion of nonopioid-related inpatient stays in this age group (74.2 percent involved White patients). White patients also constituted 71.7 percent of all opioid-related ED visits among patients aged 65 years and older in 2015. Again, this was very similar to the 71.1 percent of nonopioid-related ED visits that involved White patients in this age group. Non-White racial/ethnic groups constituted a much lower proportion than White patients of both opioid-related and nonopioid-related hospitalizations among patients aged 65 years and older. For example, Hispanic patients represented 5.3 percent of opioid-related inpatient stays and 6.5 percent of nonopioid-related stays; Asian/Pacific Islanders represented 1.3 percent of opioid-related inpatient stays and 2.3 percent of nonopioid-related stays. The distribution by community-level income among patients aged 65 years and older was similar for opioid-related and nonopioid-related hospitalizations. Among patients aged 65 years and older, the proportion of hospitalizations by community-level income was similar for opioid-related and nonopioid-related inpatient stays and ED visits in 2015. For example, just over 1 in 4 inpatient stays were among patients in the lowest income quartile: 27.5 percent of opioid-related stays and 27.4 percent of nonopioid-related stays. Over 1 in 5 inpatient stays were among patients in the highest income quartile: 21.4 percent of opioid-related stays and 21.1 percent of nonopioid-related stays. Figure 6 provides the population rate of opioid-related inpatient stays and ED visits compared with the rate of nonopioid-related inpatient stays and ED visits among patients aged 65 years and older by U.S. census region in 2015. The ratio of each census region rate to the national rate also is provided in the figure and reflected in the color-coding of the maps. Four colored maps that show the rate per 100,000 population of opioid- and non-opioid-related inpatient stays and ED visits among patients aged 65+ years by census region and ratio of census region to national rate in 2015. Opioid-related inpatient stays: national rate = 268; West, rate = 370, ratio to national rate >1.2; Midwest, rate = 254, ratio to national rate 0.90-0.99; South, rate = 228, ratio to national rate 0.80-0.89; Northeast, 244, ratio to national rate 0.90-0.99. Non-opioid-related inpatient stays: national rate = 26,992; West, rate = 22,200, ratio to national rate 0.80-0.89; Midwest, rate = 28,935, ratio to national rate 1.00-1.09; South, rate = 28,025, ratio to national rate 1.00-1.09; Northeast, 28,203, ratio to national rate 1.00-1.09. Opioid-related ED visits: national rate = 78; West, rate = 126, ratio to national rate <1.2; Midwest, rate = 72, ratio to national rate 0.90-0.99; South, rate = 67, ratio to national rate 0.80-0.89; Northeast, 51, ratio to national rate <0.80. Non-opioid-related ED visits: national rate = 37.930; West, rate = 36,183, ratio to national rate 0.90-0.99; Midwest, rate = 41,976, ratio to national rate 1.10-1.19; South, rate = 38,554, ratio to national rate 1.00-1.09; Northeast, 34,010, ratio to national rate 0.90-0.99. Among patients aged 65 years and older, those residing in western States had the highest rate of opioid-related hospitalizations, but the lowest rate of nonopioid-related hospitalizations compared with other regions of the United States in 2015. The rate of opioid-related inpatient stays among patients aged 65 years and older was highest in western States in 2015 (370 per 100,000 population vs. the national average of 268 per 100,000 population). In contrast, those residing in western States had the lowest average rate of nonopioid-related inpatient stays (22,200 per 100,000 population vs. the national average of 26,992 per 100,000 population). Similarly, the rate of opioid-related ED visits among patients aged 65 years and older was highest in western States (126 per 100,000 population vs. the national average of 78 per 100,000 population). In contrast, those residing in western States had the second lowest average rate of nonopioid-related ED visits (36,183 per 100,000 population vs. the national average of 37,930 per 100,000 population). CCS categorizes ICD-9-CM diagnosis codes into a manageable number of clinically meaningful categories.17 This clinical grouper makes it easier to quickly understand patterns of diagnoses. CCS categories identified as Other typically are not reported; these categories include miscellaneous, otherwise unclassifiable diagnoses that may be difficult to interpret as a group. These codes include opioid-related use stemming from illicit opioids such as heroin, illegal use of prescription opioids, and the use of opioids as prescribed. Each type of opioid use is important for understanding and addressing the opioid epidemic in the United States.18 Although there may be interest in examining how much each type of opioid use contributes to the overall opioid problem, many of the opioid-related codes under the ICD-9-CM clinical coding system do not allow heroin-related cases to be explicitly identified (e.g., in the 304.0x series, heroin is not distinguished from other opioids). In addition, the codes do not distinguish between illegal use of prescription drugs and their use as prescribed. Chronic conditions were identified using the set of chronic conditions developed by the U.S. Department of Health and Human Services (HHS) Interagency Workgroup on multiple chronic conditions (MCC) and the Office of the Assistant Secretary of Health.19 As reported by Goodman and colleagues (2013), 20 chronic conditions were identified with definitions for five selected HHS health data systems, including the HCUP Nationwide Inpatient Sample (NIS). For the HCUP inpatient databases, the 20 chronic conditions were defined using the Agency for Healthcare Research and Quality (AHRQ) Clinical Classifications Software (CCS), which groups together highly related diagnoses of the same condition. One condition, autism spectrum disorder, was defined using ICD-9-CM diagnosis codes rather than CCS categories. Steiner and Friedman (2013) implemented these chronic condition definitions in an analysis of MCC using the 2009 NIS.20 The 20 chronic conditions and corresponding clinical coding criteria are provided in Table 2. Consistent with Steiner and Friedman (2013), we identified chronic conditions on the basis of the clinical coding criteria (listed in Table 2) indicated in either a principal or a secondary diagnosis code field on the discharge record. A chronic condition was counted only once per discharge regardless of the number of diagnosis codes (principal and secondary) that indicated the condition. Because the number of secondary diagnoses reported on hospital discharge and ED visit records in HCUP data has increased over time, we held the number of secondary diagnosis fields constant across both data years to ensure comparability: 25 diagnosis codes for hospital discharge records and 15 diagnosis codes for ED visit records. The unit of analysis is the hospital discharge (i.e., the hospital stay) or the ED visit, not a person or patient. This means that a person who is admitted to the hospital or seen in the ED multiple times in 1 year will be counted each time as a separate discharge from the hospital or visit in the ED. Charges represent what the hospital billed for the discharge. Hospital charges reflect the amount the hospital charged for the entire hospital stay and do not include professional (physician) fees. For the purposes of this Statistical Brief, charges are rounded to the nearest hundred dollars. Total hospital charges were converted to costs using HCUP Cost-to-Charge Ratios based on hospital accounting reports from the Centers for Medicare & Medicaid Services.21 Costs reflect the actual expenses incurred in the production of hospital services, such as wages, supplies, and utility costs; charges represent the amount a hospital billed for the case. For each hospital, a hospital-wide cost-to-charge ratio is used. Hospital charges reflect the amount the hospital billed for the entire hospital stay and do not include professional (physician) fees. For the purposes of this Statistical Brief, costs are reported to the nearest hundred. Annual costs were inflation adjusted using the Gross Domestic Product Price Index from the U.S. Department of Commerce, Bureau of Economic Analysis, with 2015 as the index base.22 That is, all costs are expressed in 2015 dollars. Annual charges were inflation adjusted using the Consumer Price Index for Urban Consumers from the U.S. Department of Labor, Bureau of Labor Statistics, with 2015 as the index base.23 That is, all charges are expressed in 2015 dollars. Community-level income is based on the median household income of the patient's ZIP Code of residence. Quartiles are defined so that the total U.S. population is evenly distributed. Cut-offs for the quartiles are determined annually using ZIP Code demographic data obtained from Claritas, a vendor that adds value to data from the U.S. Census Bureau.24 The value ranges for the income quartiles vary by year. The income quartile is missing for patients who are homeless or foreign. Discharge status reflects the disposition of the patient at discharge from the hospital and includes the following six categories: routine (to home), transfer to another short-term hospital, other transfers (including skilled nursing facility, intermediate care, and another type of facility such as a nursing home), home health care, against medical advice, or died in the hospital. Data on Hispanic ethnicity are collected differently among the States and also can differ from the census methodology of collecting information on race (White, Black, Asian/Pacific Islander, American Indian/Alaska Native, Other [including mixed race]) separately from ethnicity (Hispanic, non-Hispanic). State data organizations often collect Hispanic ethnicity as one of several categories that include race. Therefore, for multistate analyses, HCUP creates the combined categorization of race and ethnicity for data from States that report ethnicity separately. When a State data organization collects Hispanic ethnicity separately from race, HCUP uses Hispanic ethnicity to override any other race category to create a Hispanic category for the uniformly coded race/ethnicity data element, while also retaining the original race and ethnicity data. This Statistical Brief reports race/ethnicity for the following categories: Hispanic, non-Hispanic White, non-Hispanic Black, Asian/Pacific Islander, and non-Hispanic Other. Fingar KR (IBM Watson Health), Skinner H (IBM Watson Health), Johann J (IBM Watson Health), Coenen N (IBM Watson Health), Freeman WJ (AHRQ), Heslin KC (AHRQ). Geographic Variation in Substance-Related Inpatient Stays Across States and Counties in the United States, 2013â€“2015. HCUP Statistical Brief #245. November 2018. Agency for Healthcare Research and Quality, Rockville, MD. www.hcup-us.ahrq.gov/reports/statbriefs/sb244-Opioid-Inpatient-Stays-ED-Visits-Older-Adults.pdf. This Statistical Brief was posted online on September 18, 2018. 1 Substance Abuse and Mental Health Services Administration. Opioid Misuse Increases Among Older Adults. National Survey on Drug Use and Health: The CBHSQ Report. July 25, 2017. www.samhsa.gov/data/sites/default/files/report_3186/Spotlight-3186.html. Accessed July 24, 2018. 2 U.S. Department of Health & Human Services, Office of Inspector General. Opioids in Medicare Part D: Concerns About Extreme Use and Questionable Prescribing. HHS OIG Data Brief. July 2017. www.oig.hhs.gov/oei/reports/oei-02-17-00250.pdf. Accessed July 24, 2018. 3 Weiss AJ, Bailey MK, O'Malley L, Barrett ML, Elixhauser A, Steiner CA. Patient Characteristics of Opioid-Related Inpatient Stays and Emergency Department Visits Nationally and by State, 2014. HCUP Statistical Brief #224. June 2017. Agency for Healthcare Research and Quality, Rockville, MD. www.hcup-us.ahrq.gov/reports/statbriefs/sb224-Patient-Characteristics-Opioid-Hospital-Stays-ED-Visits-by-State.pdf. Accessed July 24, 2018. 4 Gerteis J, Izrael D, Deitz D, LeRoy L, Ricciardi R, Miller T, et al. Multiple Chronic Conditions Chartbook: 2010 Medical Expenditure Panel Survey Data. Rockville, MD: Agency for Healthcare Research and Quality; 2014. www.ahrq.gov/sites/default/files/wysiwyg/professionals/prevention-chronic-care/decision/mcc/mccchartbook.pdf. Accessed July 27, 2018. 5 Institute of Medicine, Board on Health Sciences Policy, Committee on Advancing Pain Research, Care, and Education. Relieving Pain in America: A Blueprint for Transforming Prevention, Care, Education, and Research. Washington, DC: The National Academies Press; 2011. 6 He W, Larsen LJ. Older Americans With a Disability: 2008-2012. U.S. Census Bureau, American Community Survey Reports, ACS-29. U.S. Government Printing Office, Washington, DC; 2014. 7 Centers for Disease Control and Prevention. Annual Surveillance Report of Drug-Related Risks and Outcomes—United States, 2017. Surveillance Special Report 1. Centers for Disease Control and Prevention. August 31, 2017. www.cdc.gov/drugoverdose/pdf/pubs/2017-cdc-drug-surveillance-report.pdf. Accessed July 27, 2018. 8 Bartels SJ, Blow FC, Brockmann LM, Van Citters AD. Substance Abuse and Mental Health Among Older Americans: The State of the Knowledge and Future Directions. Report prepared for the Substance Abuse and Mental Health Services Administration. Rockville MD: Westat; 2005. www.gsa-alcohol.fmhi.usf.edu/Substance%20Abuse%20and%20Mental%20Health%20Among%20Older%20Adults-%20The%20State%20of%20Knowledge%20and%20Future%20Directions.pdf. Accessed August 6, 2018. 9 Valtorta N, Hanratty B. Loneliness, isolation and the health of older adults: do we need a new research agenda? Journal of the Royal Society of Medicine. 2012 Dec;105(12):518-22. 10 Miller M, Sturmer T, Azrael D, Levin R, Solomon DH. Opioid analgesics and the risk of fractures among older adults with arthritis. Journal of the American Geriatrics Society. 2011;59(3):430-8. 11 Pisani MA, Murphy TE, Araujo KLB, Van Ness PH. Factors associated with persistent delirium following ICU admission in an older medical patient population. Journal of Critical Care. 2010;25(3):540.e1-540.e7. 12 National Center for Health Statistics. Health, United States, 2016: With Chartbook on Long-Term Trends in Health. Table 79. Hyattsville, MD: National Center for Health Statistics; 2017. www.cdc.gov/nchs/data/hus/hus16.pdf. Accessed July 30, 2018. 15 We used fiscal years (FYs) in this Statistical Brief because beginning FY 2016, on October 1, 2015, the United States transitioned from the International Classification of Diseases, Ninth Revision, Clinical Modification (ICD-9-CM) clinical coding system to the International Classification of Diseases, Tenth Revision, Clinical Modification/Procedural Coding System (ICD-10-CM/PCS) clinical coding system. Although codes for opioid-related diagnoses are available in both coding systems, the change in coding systems resulted in a substantial shift in the number of opioid-related inpatient stays (ref. Heslin KC, Owens PL, Karaca Z, Barrett ML, Moore BJ, Elixhauser A. Trends in opioid-related inpatient stays shifted after the US transitioned to ICD-10-CM diagnosis coding in 2015. Medical Care. 2017;55(11):918-23). As a result, for comparability across years in this Statistical Brief, we used 2 FYs (2010 and 2015) with clinical coding entirely under the ICD-9-CM coding system. 16 Claritas. Claritas Demographic Profile. www.claritas.com. Accessed January 18, 2018. 17 Agency for Healthcare Research and Quality. HCUP Clinical Classifications Software (CCS) for ICD-9-CM. Healthcare Cost and Utilization Project (HCUP). Agency for Healthcare Research and Quality. Updated March 2017. www.hcup-us.ahrq.gov/toolssoftware/ccs/ccs.jsp. Accessed January 18, 2018. 18 Compton WM, Jones CM, Baldwin GT. Relationship between nonmedical prescription-opioid use and heroin use. The New England Journal of Medicine. 2016;374:154-63. 19 Goodman RA, Posner SF, Huang ES, Parekh AK, Koh HK. Defining and measuring chronic conditions: imperatives for research, policy, program and practice. Preventing Chronic Disease. 2013;10:120239. 20 Steiner CA, Friedman B. Hospital utilization, costs, and mortality for adults with multiple chronic conditions, Nationwide Inpatient Sample, 2009. Preventing Chronic Disease. 2013;10:120292. 21 Agency for Healthcare Research and Quality. HCUP Cost-to-Charge Ratio (CCR) Files. Healthcare Cost and Utilization Project (HCUP). 2001-2015. Agency for Healthcare Research and Quality. Updated December 2017. www.hcup-us.ahrq.gov/db/state/costtocharge.jsp. Accessed January 18, 2018. 22 U.S. Bureau of Economic Analysis. GDP & Personal Income Tables, Table 1.1.4. Price Indexes for Gross Domestic Product. www.bea.gov/iTable/iTable.cfm?reqid=19&step=2#reqid=19&step=3&isuri=1&1910=x&0=-99&1921=survey&1903=4&1904=2000&1905=2016&1906=a&1911=0. Accessed March 26, 2018. 23 U.S. Bureau of Labor, Bureau of Labor Statistics, Table 24. Historical Consumer Price Index for All Urban Consumers (CPI-U): U. S. City Average, All Items. www.bls.gov/cpi/tables/supplemental-files/historical-cpi-u-201803.pdf. Accessed April 17, 2018. 24 Claritas. Claritas Demographic Profile by ZIP Code. www.claritas360.claritas.com/mybestsegments/. Accessed June 6, 2018. Internet Citation: Statistical Brief #244. Healthcare Cost and Utilization Project (HCUP). September 2018. Agency for Healthcare Research and Quality, Rockville, MD. www.hcup-us.ahrq.gov/reports/statbriefs/sb244-Opioid-Inpatient-Stays-ED-Visits-Older-Adults.jsp?utm_source=ahrq&utm_medium=en1&utm_term=&utm_content=1&utm_campaign=ahrq_en1_29_2019.